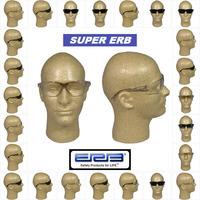 A well-known company for protective eyewear is ERB. The company is an industry-leader for top-notch safety glasses and was founded around 1956. Over time, ERB went on to manufacturer several other types of products, and the company markets to the industrial, manufacturing and construction industries. ERB believes in profitable business partnerships and helping consumers get top-notch protective eyewear. We carry several different product lines from ERB because we want to make sure you find what you’re looking for. 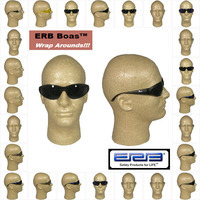 Our ERB Boas Wraparounds are popular because they’re very stylish but also very functional. You’ll find our Boas Wraparounds with blue mirror, amber, clear and gold silver lenses. Our selection of ERB safety glasses is quite large, so you shouldn’t have any trouble finding the pair that you need. Although our ERB glasses with clear lenses are some of the most popular, we offer ERB products with several different lenses. If you’re just looking for a basic pair for general applications, you might consider our ERB Boas Wraparounds Safety Glasses with Clear Lens. However, if you need something else, there is a good chance that we’ll have it.